The first order of business at Jarrett Bay was to have the boat hauled out to assess the condition of our bottom paint (scroll down to technical details if interested). 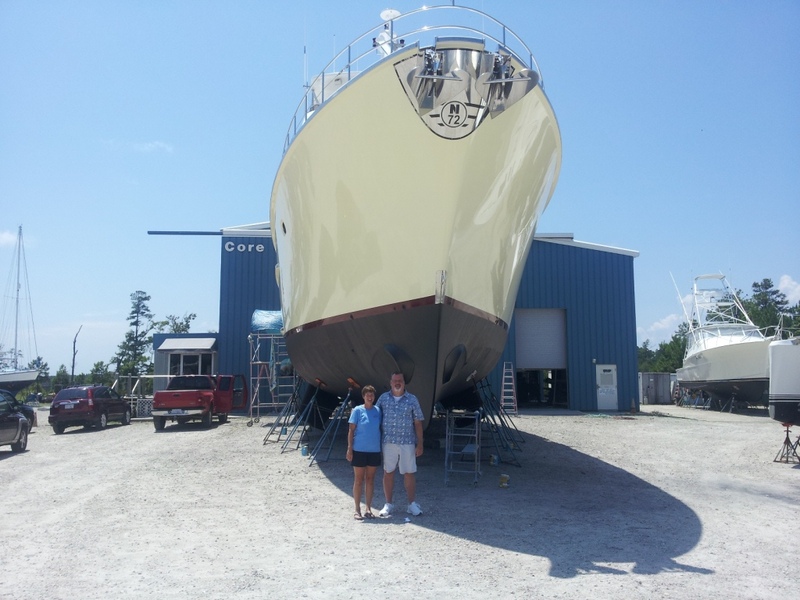 The haul out went smoothly and representatives from Core Creek Marine and Bluewater, the paint manufacturer, were on hand to develop a game plan for re-painting the bottom. Work commenced the next day and we hoped that our time out of the water would be limited to just two weeks. Since it is the tourist season in Beaufort, our house in Sea Gate where we stayed last time was not available for rental and we stayed at the nearby Core Creek Lodge, an inexpensive motel just minutes from the boat yard. We found newly renovated and clean rooms, helpful and friendly service, a room adjoining a full kitchen, and a wonderful gas grill, all right on the Intracoastal Waterway. While the boat was out of the water we also decided to have the hull waxed again and contacted Bruce from Ultra-Bright who had done a great job last time. Soon he was at work and pointed out some rust stains coming from the hinges on the doors to the scuppers (these are trap-doors that open one-way to allow water to drain from the decks, but do not allow water to come in the other way). 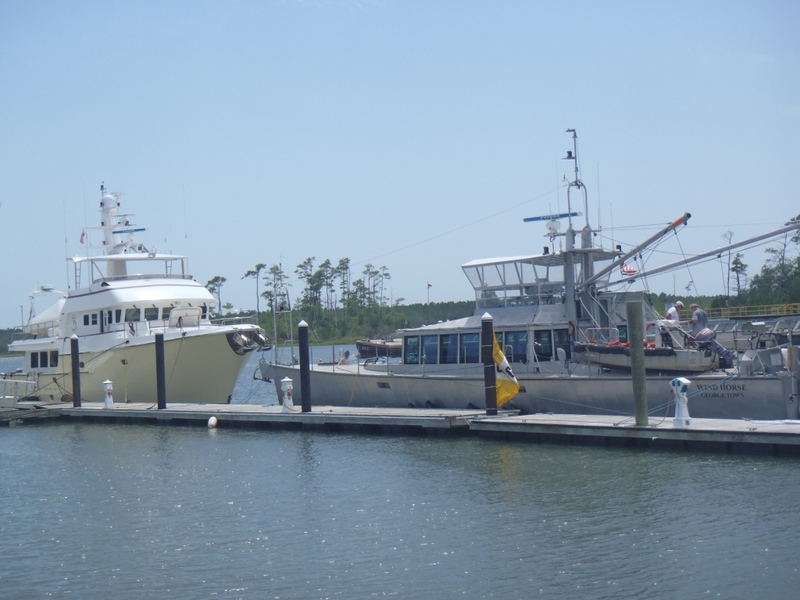 This turned into a typical boat project – start one job and find another! Each door was secured by two hinges, which of course are not easy to get to as they are on the outside of the boat and way up high, requiring scaffolding to reach. Each stainless steel hinge had to be removed, buffed by Bradley on a machine, then hand polished with metal polish by Kathy. Finally each one had to be re-attached and sealed with Sikaflex, a special adhesive weather-stripping compound, that is very messy to work with. You always end up with black goo on yourself and parts of the boat where you do not want it! All told, this task consumed more than 20 hours of time. his foster mom, Meg. Jordan, who is now 13, continues to amaze us with his good health and zest for life. His shoulder and hips are pretty creeky now, but he doesn’t want to slow down! We were back in the water in just two weeks, a major accomplishment, and headed out to Cape Lookout for a few days of fun. Cape Lookout is just a two hour trip from Jarrett Bay so soon we were anchored and enjoying the chance to swim, kayak, and explore. 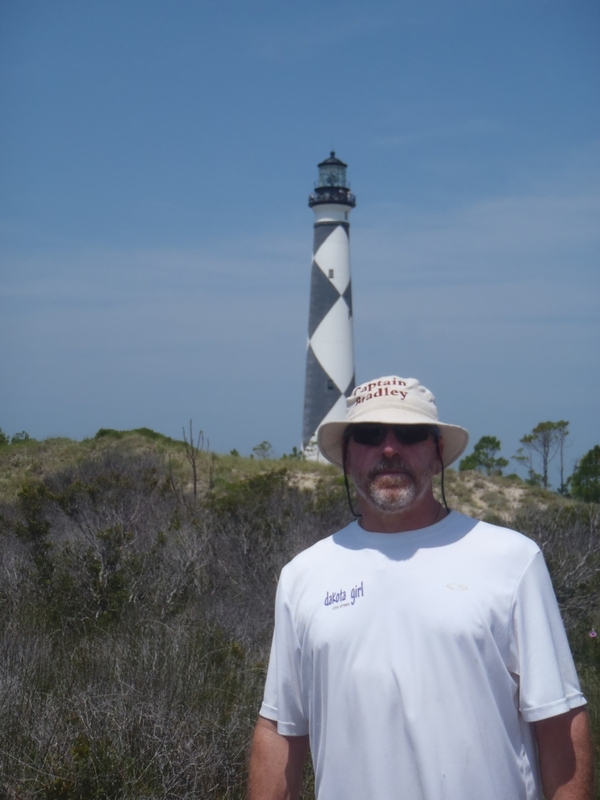 We went ashore to see the Cape Lookout Lighthouse and museum and took the tender to Harker’s Island. Cathy and her husband Cory came out for a visit and delivered a part we had ordered and Pam, Lenny, Danny and Carole from Sea Gate came out in their boat for a visit and a day on the beach. They left us with delicious tomatoes and cantaloupe from their gardens – very yummy! Next up was a 70 mile trip to Wrightsville Beach, about a ten hour trip. We planned for an 8pm departure and were actually underway by 7:30pm. 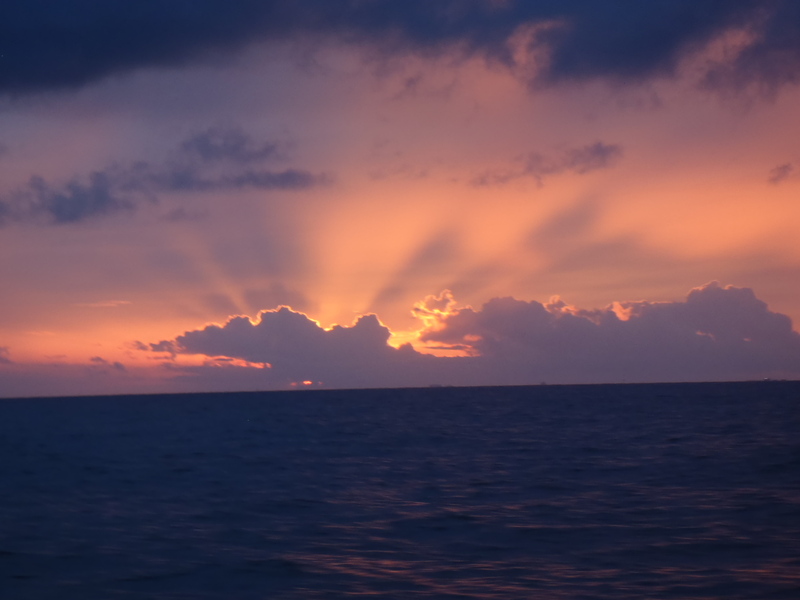 Despite slowing the boat to less than 6 knots for the final two hours, we still arrived at the entrance to Masonboro inlet before sunrise. Fortunately it is well marked and gave us a chance to practice our entrance skills. Soon we were safely docked at Sea Path marina, where we left the boat for a few days to fly to Naples, FL to celebrate Bradley’s father’s 79th birthday. We will stay here in Wrighstville Beach for a couple weeks before heading north to the Chesapeake Bay. We don’t want to get there until September as we have very bad memories of being on the Potomac on August 25th last year! Speaking of which, I have now completed the epic saga of the lightning strike and ensuing repairs. Scroll down for technical details. Check out updated book reviews. DO NOT REPLY if you get this by email – please leave a comment below or Click here to email us – we love to hear from you! I especially appreciate suggestions as to what you would like to see on the blog. Bottom Paint. When in Jarrett Bay for the lightning repairs, we had extensive work done on the bottom (unrelated to the lightning strike). When we had purchased the boat in 2010 we knew it had some blisters on the bottom and had planned to address them at the next haul out. These were caused when during the fairing process in the initial build, the wrong kind of filler was used and it absorbed water, causing blisters. As a result, we had to remove all bottom paint, including the barrier coat, sand the bottom to remove the blister causing filler, then re-apply three barrier coats and three coats of bottom paint. The first coat of bottom paint was green and the second two were black. This allows you to tell when you are down to the last coat as the green will begin to show, at which point you would re-apply the bottom paint (but not usually the barrier coat). How long this takes depends on many factors, but generally we would expect at least 18-24 months before needing to re-paint the bottom. However, just two months after leaving Jarrett Bay, Bradley inspected the bottom (which we always do when at anchor) and noticed bits of green already showing through. He notified Core Creek Marine, the yard that had done the bottom job, and the paint manufacturer that we may have a problem. By the time we reached the Bahamas, we could clearly see green showing in many places. We arranged to return to Jarrett Bay and have the boat hauled out so the paint company representative could inspect it and determine what had happened. 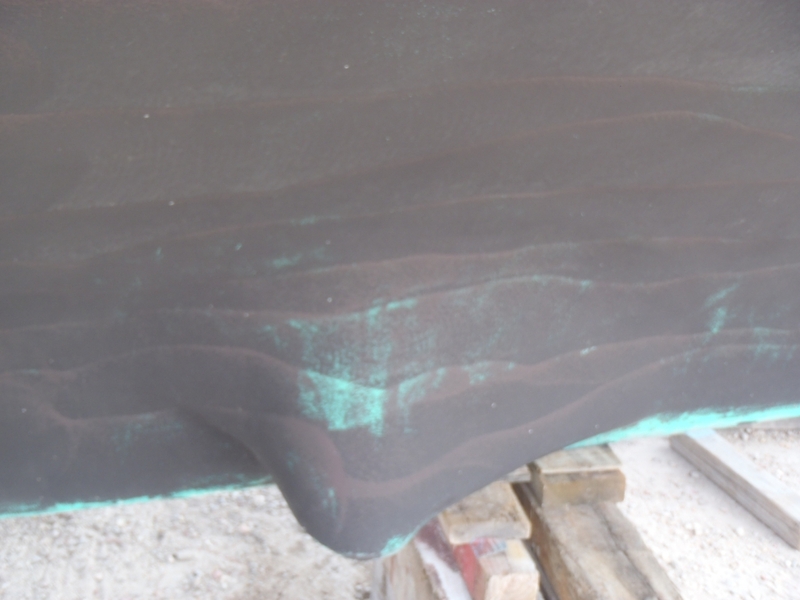 Sure enough, when the boat was hauled, it revealed that the bottom paint had in essence “fallen off”. It had been applied exactly according to manufacturer’s specifications for temperature, time between coats, etc. The paint company has no reports of similar problems. Everyone was stumped as to what had happened, but we agreed to a plan whereby the paint company would supply more paint and the yard would provide the labor to apply it, all under warranty. Obviously, we will monitor it very closely. Sea-Tel. 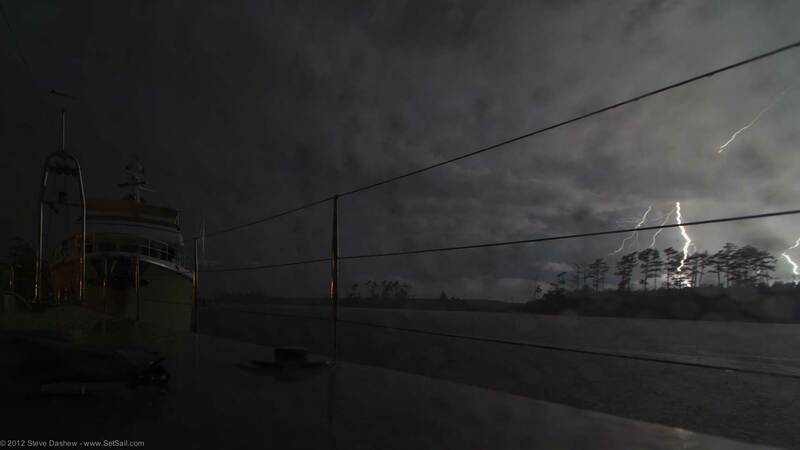 Upon arrival at Jarrett Bay we were unable to get a DirecTv signal. We had replaced several components of our Sea-Tel satellite system while in Florida. While this normally would not have been a critical problem, the Olympics were about to start! 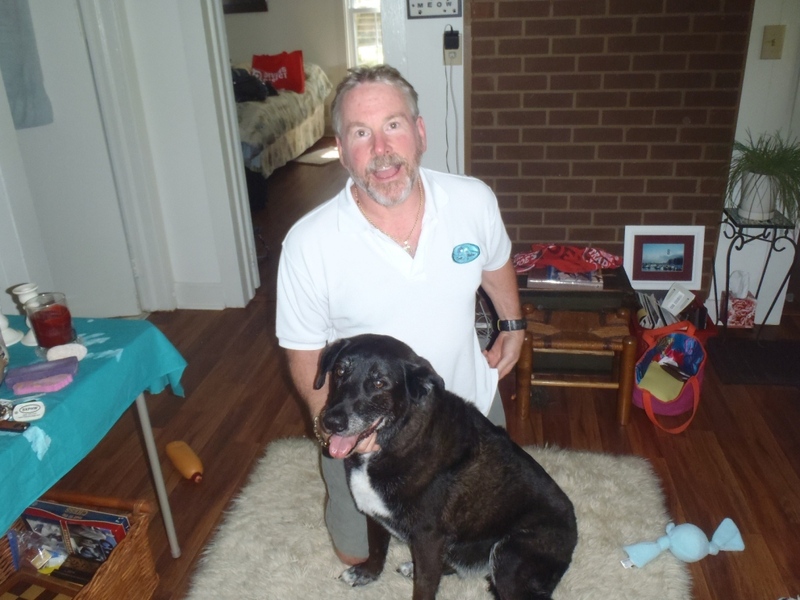 Steve, our electrician in NC and his associate Fran were finally able to track down two problems. 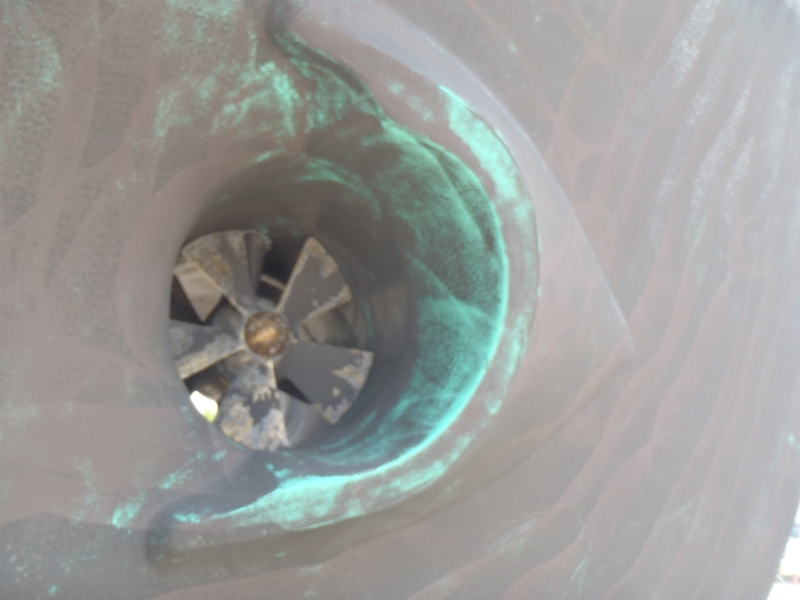 First, there was a bad motor in the antenna unit, resulting in a “dead spot” during the search process. Second, there were two wires leading into the multi-switch that were reversed. Soon we were back on track with TV, ready to record all the Olympic events! Frequency Meters. I previously reported that the new frequency meters on our main power board were not working. We ordered new ones from Nordhavn (under warranty) and replaced them. They seem to be fine now. Spot lights – our outdoor spot lights had been blowing out bulbs. Steve tested the lights and found no significant problem – he suggested that we upgrade to a heavier duty bulb so all bulbs have been replaced. This entry was posted on August 8, 2012, 8:39 am and is filed under Trips. You can follow any responses to this entry through RSS 2.0. You can leave a response, or trackback from your own site.
. So, if the pins ever rust again, you might either substitute properly fabricated steel rod or treat the existing rods. An interim cosmetic treatment can be found in supermarkets. The product’s name is “Wink”. I think it contains a weak solution of nitric acid and is used by many to remove discoloration from stainless steel.